"A dispassionate and rich analysis of the social costs of globalization that should be welcomed both by defenders and critics of the new global economic order." "Worth reading by anyone before entering the battle over globalization, including legislators considering policy-related actions and laws." This book examines the impacts of globalization and the new information technologies on the countries of the Third World. It focuses on growth and productivity, poverty and income distribution, and employment, with experiences and opinions presented from Latin America, Africa, South Asia, and East and Southeast Asia. Further, it demonstrates why the process of globalization needs to be managed carefully to minimize costs and maximize gains, and argues convincingly that the benefits of freer trade and capital flows need to be weighed against the social costs involved. 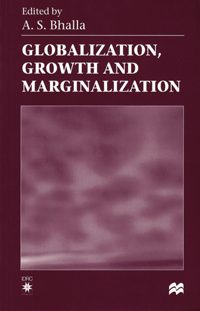 Mondialisation, croissance et marginalisation is the first book to systematically and empirically explore both the benefits and the costs of globalization in terms of worsening poverty and growing unemployment. The book will appeal to policymakers and bureaucrats dealing with development and globalization issues; economists and development specialists; and researchers, scholars, and students in development sciences and economics worldwide. A.S. Bhalla is currently David Thompson Senior Research Fellow at Sidney Sussex College in Cambridge, England. During the preparation of this book, Professor Bhalla was Special Advisor to the President of IDRC, as well as IDRC Pearson Fellow. In addition to his long and distinguished career with the International Labour Office in Geneva, Professor Bhalla has been Hallsworth Professorial Fellow in Economics at the University of Manchester, Visiting Research Associate at the Economic Growth Center at Yale University, and Research Officer at the Institute of Economics and Statistics at the University of Oxford. He is the author and editor of several books, including Uneven Development in the Third World and Regional Blocs: Building Blocks or Stumbling Blocks?